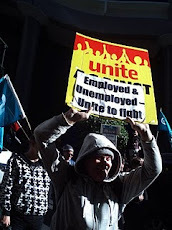 Unite is a union for low paid workers unemployed and beneficiaries. 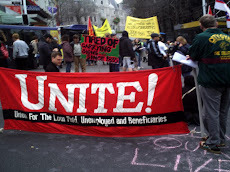 Unite Waitemata Community Branch includes students, mothers, carers, those with illnesses or disabilities, unemployed, full time and casual workers. We are all members of the working class and united we will win! The Welfare Working Group headed by Paula Rebstock has produced its first issues report. They claim that our benefits are unsustainable and even make the ridiculous prediction that the expenditure could go from something like 6 billion to 50 billion. This is absolute nonsense. The only thing that is unsustainable is capitalism. The panel bemoans the fact that the state now support single mothers, which it once did not. The introduction of the DPB in the 1970's was a progressive step. Mothering is work. Mothers and carers should receive a living income for themselves and their families. It also bemoans the length of time that some people are on benefits, even though the majority are only on them short term. Instead of trying to get people off benefits as quickly as possible, the Government should be creating real jobs, and recognising the value of the work that single parents do. If it wants to help single mothers into meaningful and suitable work, with adequate childcare, It should not have cut early childhood education funding, or funding which allows single parents to do tertiary study. 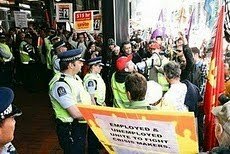 The New Zealand Herald makes a big deal out of the suggestion that bosses might contribute pay into this scheme, but it is in fact the workers who put their lives on the line with it. It's the workers who pay and risk getting nothing back if they have not worked enough hours, or didn't have a job in the first place. The next report of the Welfare Working Group is out in September, where they make their recommendations. here's a link to the WWG report. We need a network of beneficiary activists to campaign vigorously against all these dangerous proposals; and those for those who like making submissions to do so to the panel. welfare working group, (see our links at the left). Everyone is welcome at meetings! 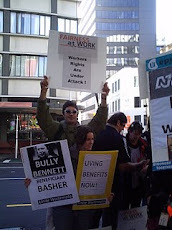 We support each other with problems with WINZ and Unite will represent you with your employer. Unite Fees are are 1% of income or $2.00 per week minimum. We hope to get beneficiary fees reduced at the next AGM. Associate Group membership is 50c per week. and we will post you an enrolment form. Waitemata Unite Community Branch meets every 2 months on the third Saturday of the month. We currently meet the Pacific Events and Entertainment Trust Rooms at 50 A Rosebank Rd, Avondale . To find out about our next meeting contact Paul 09 8374503 or Keith 02108295170, or email unitewaitemata@gmail.com. Are you having problems with WINZ , your employer, or educational institution ? Can't make ends meet ? Benefit, pension, student allowance, or wage far too low? Refused help for your medical needs? Sanctioned for weeks or even months at a time ? Sacked under 90 Day Act, then facing 3 months Stand Down? Not getting the benefit you are entitled to? Not being told what you entitled to ? Paying secondary tax, high benefit rebates? Evicted from a state or rental accommodation? Can't get a Housing New Zealand home? Shut out of WINZ if you have no ID or appointment? Long waits to get an appointment? Forced to put your children in harmful childcare? Forced to seek work whilst sick or full time parenting? Can't visit your family overseas? Stung with a massive debt you knew nothing about? Told to see a designated doctor? Treated with cruelty or disrespect? Come to our Meetings and Share your stories! Our members help each other with problems with WINZ! "Problems with WINZ, Share your stories! " 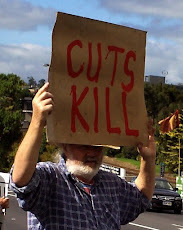 Welfare Bashing, Gordon Campbell's view. Australia; Tax Mining Boom, End Poverty. Why You Need to Join Unite! N.B There has been an addition to the constitution since 1998. 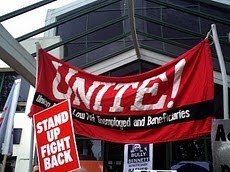 Unite is a union formed to organise casualised and low paid workers, unemployed and beneficiaries. All categories are welcome in Waitemata Branch, though it is a voice for beneficiaries within the union.